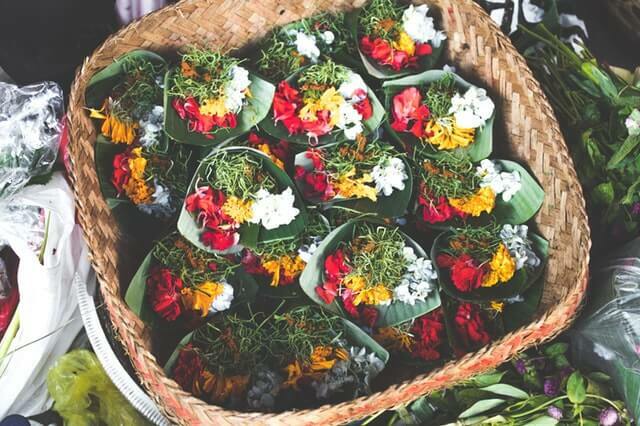 Many people and groups like to make offerings to the circle or directly to the chosen deity or spirit. This could be as a gesture of thanks for attending the ritual, giving praise and real recognition for the changing of the seasons. An offering can be any manner of thing- people from all over the world give offerings to each other in the form of gifts, many countries also hold huge ceremonies for a chosen deity where people bring many offerings to venerate them, to give thanks for their support and their challenges. Sacrifice is also another practice associated with giving something up- cutting of bread, a libation- whatever you feel is right personally to give up as an offering to a chosen cause. The sacrifice of grain can symbolise the coming of Lughnasadh or harvest celebrations. Herbs are also often burned as either as an offering or as part of a spell or ceremony. Many herbs have their own spiritual significance and care should always be taken when burning as some may be toxic in that state. If in doubt about the herb, it may be a safer alternative to find an incense stick or cone that has a similar energy to the herb you wanted to use without the dangers of being toxic. It can also be handy to know that some herbs can actually bring on a miscarriage or menstrual cycle, so it’s always a good idea to speak to someone who is trained as to which herbs may be harmful to the human body. An offering is above all your way of giving thanks- working with a chosen deity or spirit over time can be beneficial if you choose to do so, and reciprocating their help with offerings may make that relationship last longer- it’s also seen as the ‘right’ thing to do- fair exchange, etc. 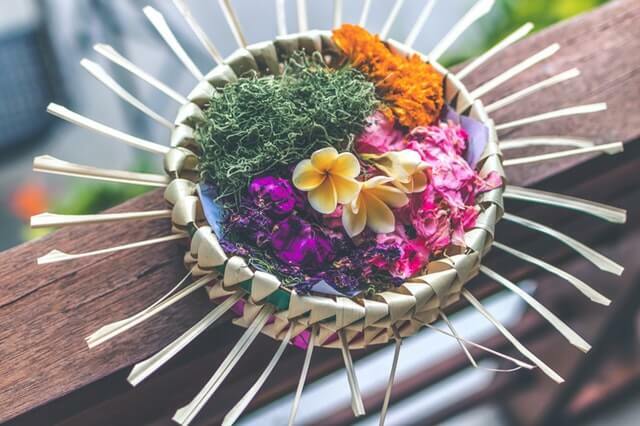 If your ceremony or ritual is outside and you are going to be leaving your offerings, consider leaving something natural that can biodegrade on its own and isn’t harmful to the natural environment. If an offering is of a beverage such as mead, milk, wine, ale, juice, etc, these can be poured onto the ground. Be aware of leaving things like small cups of beer or honey outside though as these are commonly used to trap outdoor mini-beasts like slugs, snails and bees. Some herbs can only be burned outside and some can be burned indoors, depending on the ritual or ceremony location. Always check before using herbs whether they can be burned in or outdoors- or at all in some cases. Incense can be burned inside or outside, and you can get special outdoor incense sticks. If you need protection from biting insects, citronella incense or candles can be great at warding them off- they hate the smell! It’s also far nicer to use something that deters them rather than something which will kill them like flypaper. If your ritual is going to be indoors, make sure all of the tools and offerings you intend to use during the ceremony are safe to use in the area you are practising. It’s not wise to have candles on or near flammable surfaces or items, and some properties, especially rented ones, will have a mention in their tenancy agreement that they do not allow the burning of candles and similar in the property. It’s always a good idea to make sure you’re allowed to do things, especially if the property does not belong to you. It’s not always in a longer ceremony or ritual that you may feel you want to give an offering. When taking parts of a plant or tree, many people like to give a small offering- perhaps a small amount of freshly baked bread or cake near the location the items were taken from. Some people also have prayer ties which they will hang from a tree to ask for a certain prayer or wish to be granted. It’s always wise to not tie these on too tightly- sometimes if the ties are too tight, the branch may lose its supply of nutrients and eventually die. Many people see all exchange as being an equal exchange- the tree or plant has used energy in order to grow that leaf, flower or other items, so to give something in order to say thank you make sense. Perhaps a small rodent like a shrew will pop along later on and nibble on your offering- always helping out the little spirits is a good thing! If you are unable to get to a ceremony or a location where you feel you can give offerings, simply having some bird feeders in your garden may be considered as your way of saying thank you. Providing a food source for many of the songbirds is vital, especially coming up to the winter ahead, so if you feel you can help them out, it could be as simple as that. Some people who don’t have a garden, but have a large window they can get to will have a window bird feeder. These can be fantastic to learn about the local bird population, as they are usually clear plastic holders so you can see them visit. Do bear in mind that they will most likely see you too- so be careful not to scare them off! An equal exchange is something that many pagans like to live by and it covers all paths- everything we do, say or use has consequences. Photos by Artem Bali from Pexels.